We have a huge range of business furniture for rental including office desks, bookshelves, chairs, stationery cabinets, reception counters, filing cabinets & much more. Our range of office desks or tables include standard grey melamine tables, office tables, trestle tables, reception desks, corner desks and so on. Grey Melamine Desks (1500mm x 750mm) with file & personal drawer. Office desks short & long term rental available. From 1 day to 3, 6 or 12 months or longer. You may also require other items from our range of office equipment & furniture for rental such as Mobile & Electronic Whiteboards & Chairs and so on. You can review our complete range of office equoment & furniture for hire here. Our office desks are available to rent or hire for 1 week, 1 month, 1 year or even longer depending on your needs. Prices vary significantly based on how many office desks you wish to rent. We will provide you with a price per unit including delivery & assembly if required. Pricing will also vary based on your location & any site access issues. Please call us on 0418 574 767 for a specific quotation for your requirements. We'd be delighted to help. Standard size is 450mm high x 1500mm wide. Grey fabric. 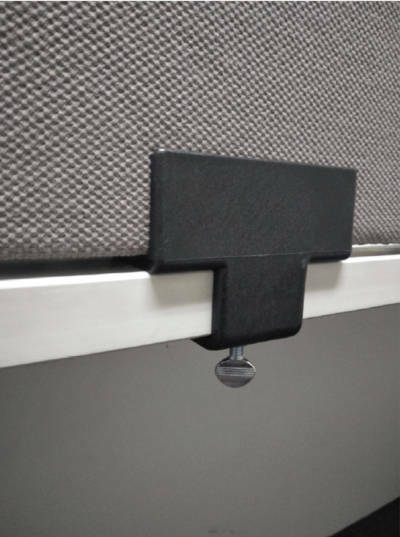 These desk mounted partitions are pinable, light weight with no loose components & they provide your work-space with noise cancellation & privacy for your workers. 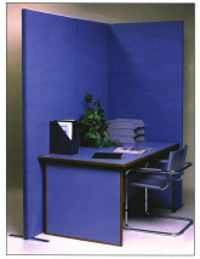 These desk mounted partition screens are easy to install. 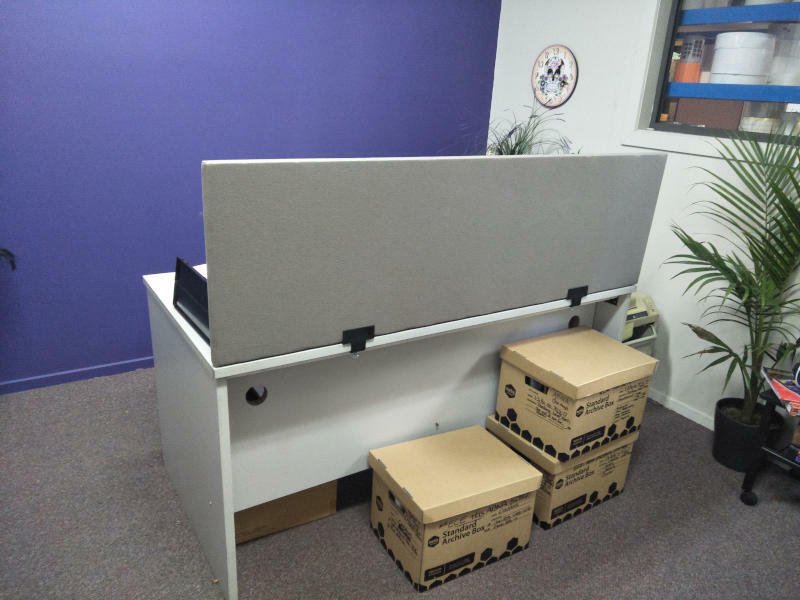 You can see in the image below an example of some grey melamine desks we recently rented to a client in Melbourne. They required desks for a temporary office. As was the case here, we can deliver and install desks if required. 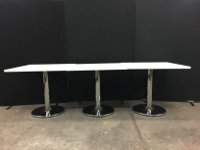 We have many styles of tables and office desks to hire available including parment or document tables, trestle tables and many other styles. Review our range of office furniture and office equipment or get in touch today to find out prices and availability. We have a pretty complete range of office furniture & office equipment for hire or rent including office chairs, bookcases & metal filing cabinets to name just a few. You can review our product range from the menu above or simply make an inquiry. If we don't have something you need, we'll probably be able to get it for you! 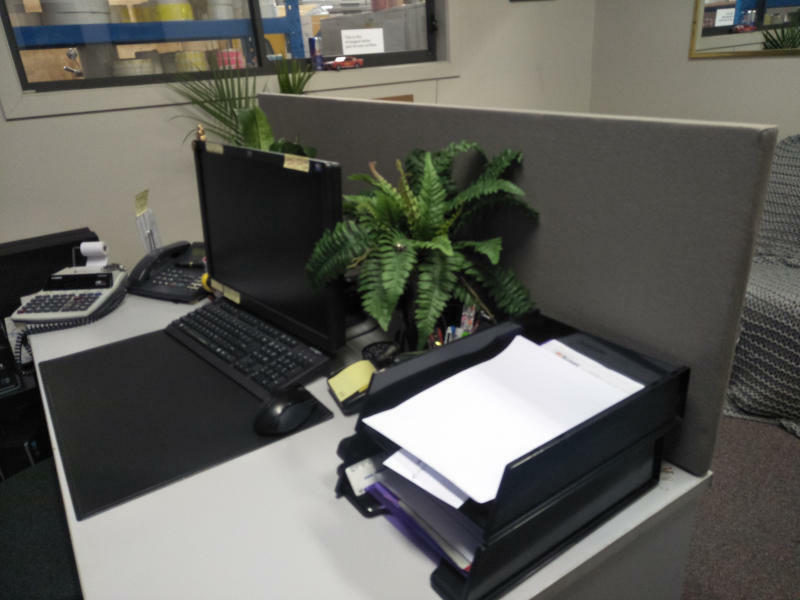 To make an inquiry regarding our office desks for hire or rental or any of our office furniture rental products, please feel free to contact us either by telephone (on 0418 574 767 or in Victoria on (03) 8420 7788), email; or by using our Inquiry/Booking Form. We will endeavour to respond to your email or Inquiry Form submission within 24 business hours. As our available products change regularly, it is not possible for us to list every rental Office Desk we have available at any time on this site. If you cannot find what you are looking for here on our web site, please feel free to call us (on 0418 574 767 or in Victoria on (03) 8420 7788), email us or use our Inquiry/Booking Form to make an inquiry. We will endeavour to respond to your inquiry within 24 business hours.